Nicole Chung was born severely premature, placed for adoption by her Korean parents, and raised by a white family in a sheltered Oregon town. From childhood, she heard the story of her adoption as a comforting, prepackaged myth. She believed that her biological parents had made the ultimate sacrifice in the hope of giving her a better life, that forever feeling slightly out of place was her fate as a transracial adoptee. But as Nicole grew up-facing prejudice her adoptive family couldn't see, finding her identity as an Asian American and as a writer, becoming ever more curious about where she came from-she wondered if the story she'd been told was the whole truth. 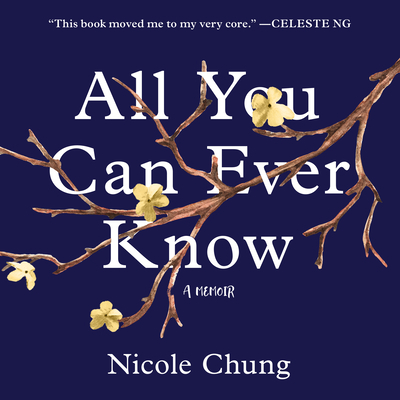 With the same warmth, candor, and startling insight that has made her a beloved voice, Nicole Chung tells of her search for the people who gave her up, which coincided with the birth of her own child. All You Can Ever Know is a profound, moving chronicle of surprising connections and the repercussions of unearthing painful family secrets-vital reading for anyone who has ever struggled to figure out where they belong.